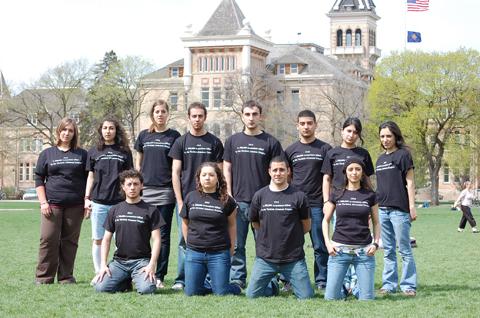 USU students model their T-shirts. Editor's note: The following story was submitted by the group leading the Armenian Genocide observance at USU. April 24, 2009 | Armenian students hold the day of remembrance for the Armenian Genocide on USU campus today, to revere the memory of the 1.5 million men, women and children fallen at the hands of the Turkish government during 1915-1923, and call the nations to peace and tolerance. This day Armenian students together with students from other countries supporting the cause are wearing T-shirts with the slogan "Recognize the Armenian Genocide." They will also write the words in the memory of the genocide victims in their Facebook profiles. By these peaceful actions, the Armenian students want to call the representatives of different cultures at USU to remember one of the biggest crimes against humanity and civilization, as well as urge the U.S Congress to pass the Armenian Genocide Resolution aimed to recognize these historical events. The Armenian Genocide, as defined by the United Human Rights Council, was the first genocide of the 20th century. It occurred when the Young Turk government made an attempt to establish a mega Turkish Empire comprising of all Turkic-speaking peoples of the Caucasus and Central Asia extending to China. The Armenian population became the main obstacle standing in the way of the realization of this policy. As a result, an estimated 1.5 million Christian Armenians living in Turkey were eliminated from their historic homeland through forced deportations and massacres. "Recognition of the fact of the Armenian Genocide is important not only for Armenians as to establish historical justice, but for all people in the world," says Sergey Ghazaryan, a senior in business administration at USU. "We must never let such villainy happen again. By recognizing the fact of the Armenian genocide, the world leaders contribute to peace and tolerance among the nations." The United States took an active part in eliminating the consequences of the Turkish atrocities. Ninety years ago, the U.S Congress adopted a historical resolution to establish the American Near East Relief, through which the U.S supplied humanitarian support to ease the suffering of Armenians, Greeks and other Near Eastern nationals. During the tragic events a lot of Armenian survivals found shelter in American land. Today the Armenian community living in the U.S. comprises more than 1 million people. Currently 42 of 50 U.S. states including Utah, as well as more than 20 countries have made individual proclamations recognizing the fact of Armenian Genocide. As the Armenian National Committee of America reported, Barack Obama's home state, Hawaii became the 42nd state of the United States to recognize the Armenian Genocide, on April 7 this year. In his pre-election speech, given on Jan. 19, 2008, Obama voiced his conviction that "the Armenian Genocide is not an allegation, a personal opinion, or a point of view, but rather a widely documented fact supported by an overwhelming body of historical evidence." "As a senator, I strongly support passage of the Armenian Genocide Resolution, and as president I will recognize the Armenian Genocide," Obama said. Despite numerous documents, evidence and artifacts of the Armenian Genocide, Turkey still denies that the massacres ever took place, and present the million of deaths as a side-effect of the First World War. "The grief of the Armenian people is that the Armenian Genocide issue is used today as an instrument of political pressure on Turkey, and not duly concerned by other countries due to many political reasons," says Gagik Melikyan, a senior in undeclared business at USU. He continues, "the Armenian nation does not feel hatred neither against the Turkish people nor the Turkish government. But we should remember that denying is like killing twice. It is enough to remember Hitler's words which he spoke to his generals before he authorized them to destroy the Jewish population of Nazi Germany, 'Who, after all, speaks today of the annihilation of the Armenians?' We Armenians are convinced that the new generation of Turkish people is democratic and brave enough to look back upon the unquestionable facts of the crimes committed against the Armenians and bring the strain in the Armenian-Turkish relations to an end." Arevik Vardanyan, a sophomore in economics and international business at USU, states "Armenians hope that the resolution will be passed by U.S. Congress in the near future and we strongly believe that it will urge other countries towards recognition of the historical events that must not to be forgotten, but accepted as a historical lesson." During the Remembrance Day for the Armenian Genocide, around 100,000 Armenians come to their historical motherland from all over the world to take part in the mourning procession at the Armenian Genocide Memorial and put flowers around the eternal fire that is located there. The Armenian Genocide Museum & Institute in Yerevan, Armenia as well as the Armenian Genocide Museum of America in Washington, D.C., also open their expositions and archives to all who want to learn more about the history of Armenian Genocide. If you would like to learn more about the Armenian Genocide, please visit http://www.genocide-museum.am/eng/index.php and don't let these people be forgotten.